This book is a transcription of the Würzburg manuscript, not a reproduction of it. The transcription occupies pages 1-258. The first 130 pages are the chapters forming the extensive introductory portion, most of which chapters were later published in the 1897 third volume of The Secret Doctrine. Then follow the stanzas from the Book of Dzyan and Blavatsky’s commentaries on them. Pages 133-246 are on cosmogenesis, and pages 249-258 are on anthropogenesis, obviously incomplete. This book also includes two appendices. We had requested permission from Daniel Caldwell to include his not well enough known article, "The Myth of the 'Missing' Third Volume of The Secret Doctrine." He agreed, and this occupies pages 351-379. 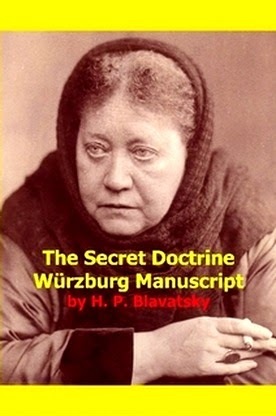 Not only did he agree to our request to include this article, he also volunteered to provide a chronology of the writing of The Secret Doctrine. This very detailed chronology occupies pages 261-349.
, and will also be at Amazon.com in about two months. Despite years of work and thousands of dollars spent in preparing this book for publication, we have priced it at only the printing cost required for worldwide distribution, $18.95. In a few months, after a number of hard copies have been sent out into the world and placed in various libraries, we will provide an electronic version free of charge.